From our local kākā and tūī, to black cockatoos and lorikeets across the ditch, all the way round the world to exquisite toucanets from Ecuador, "Birds on a Wire" celebrates the beauty and personalities of birds in a series of painterly portraits, with each bird treated as an individual, unique soul. For many years now, Judi has advocated for birds through writing and photography, as well as field work. Her step into wildlife advocacy through creative interpretation was a natural progression. Freed from the constraints of pure nature photography, Judi exposes her interpretation of the inner world of others – their thoughts and feelings, their hopes and desires – in a form tangible to the human viewer that she hopes engenders empathy with other living creatures. Caring and understanding at an emotional level can translate into action that will ensure these precious species survive. Judi lives in windy Wellington but she grew up in sunny Hawke’s Bay. It wasn’t until she returned from living overseas, however, that she truly began to appreciate New Zealand’s wildlife and scenery. She wanted to contribute towards restoring our natural heritage, so got involved as a volunteer at Zealandia EcoSanctuary in Wellington and her life changed forever. Countless hours monitoring the exploits of Wellington’s kākā parrots, with their complex social lives and engaging personalities have her hooked and they are her muse. In recent times, she assisted with the translocation of Zealandia’s kākā to Cape Sanctuary and Boundary Stream in Hawke’s Bay, and she is delighted at the thought that locals from her home town can now also enjoy these precious birds. What is fine-art photo artistry? For photo-artists, the photograph is just the first step in the creative process. One digital photo-artistic image can consist of hundreds of layers of photographs, graphics, scanned ephemera and textures, lighting and colour adjustments, and digital brushstrokes all blended and masked together to form an image that is more painting than photograph. The image may then be Giclée printed onto archival fine-art canvas or paper or other substrates. Archival framed and unframed prints are available in a variety of sizes in limited or open editions, depending on the picture. For all the pictures in this exhibition, 10% of the artist's proceeds goes back to conservation, thus both the artist and the art collector are participating in wildlife conservation. In this exhibition, donations will go to Zealandia EcoSanctuary, World Parrot Trust, BirdLife Australia, and the American Bird Conservancy - Ecuador. 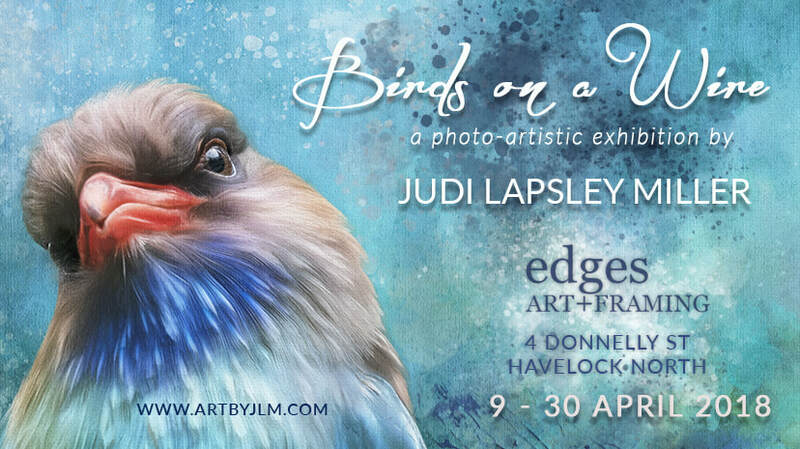 Judi will be at Edges Gallery on Friday 13 April from 10-12 and Saturday 14 April from 10-1, and at other times on the 13, 14, or 16th April by arrangement.